Requirements for other fronts kept this scenario from being reinforced by the Germans so as soon as 3 turns later June 26, 1944, Allies were already in Florence. By late Summer all northern Italy were conquered by the Allies, Allied forces coming from central Italy being helped by others coming from southern France, place in which Allies had landed in April 7, 1944. 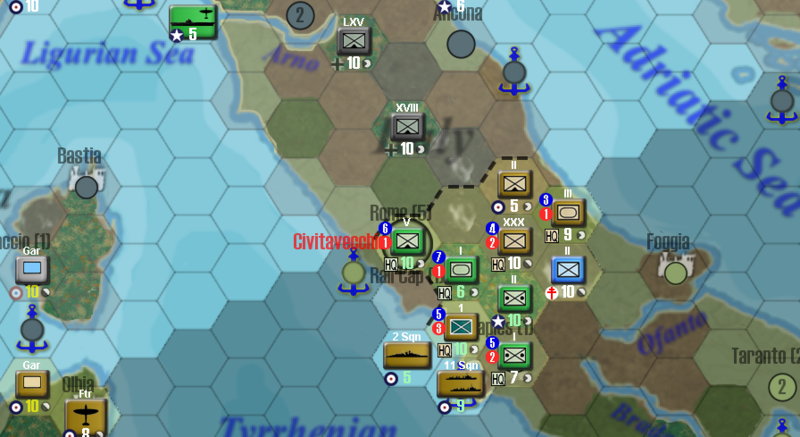 In 5 October, 1944 (turn 94), the entire Italian peninsula was in Allied hands, Allies even linking with Yugoslavian partisans. Red Army stood on the offensive the whole year through. From the breakthrough in the Donets front in late 1943 to the arrival to the Oder as early as Summer 1944, it was a continuous Axis withdrawal with no hopes to hold neither in the Dnepr nor in the Wisla rivers. Only in early 1944, near Dnepropetrovsk, were the Germans able to drive back the Soviets a bit. It was only temporary thing, since the city was liberated by the Red Army in the 2nd turn of February (turn 83). Strong Soviet push coupled with the dropping of oil levels due to Wehrmacht offensive in France, resulted in the almost complete destruction of army group south, Kiev being liberated in June 6, 1944 (turn 88). Army groups north and center mostly escaped destruction and it was with retreated units of those, with which Oder river defensive line could be manned. It was here in the Oder that the Germans were able in late Summer, to launch rather effective counterattacks against the Soviets. This way, in September 14, 1944 (turn 93), a German counterattack in Ostrava, killed a Soviet armoured, and other one near Posen, destroyed Shock unit. Situation in the southern sector of the Eastern front was completely different. Here, there wasn't a front anymore and Axis minors surrendered with little resistance to the Soviets as early as July (Romania) and August (Hungary). Vienna fell to the Soviets in September. Shot is before Allied moves since in that very turn Red Army entered Munich in Bavaria and Prague in Czechoslovakia. Wehrmacht positions at the Oder were able to hold for only 1 turn of 1945. 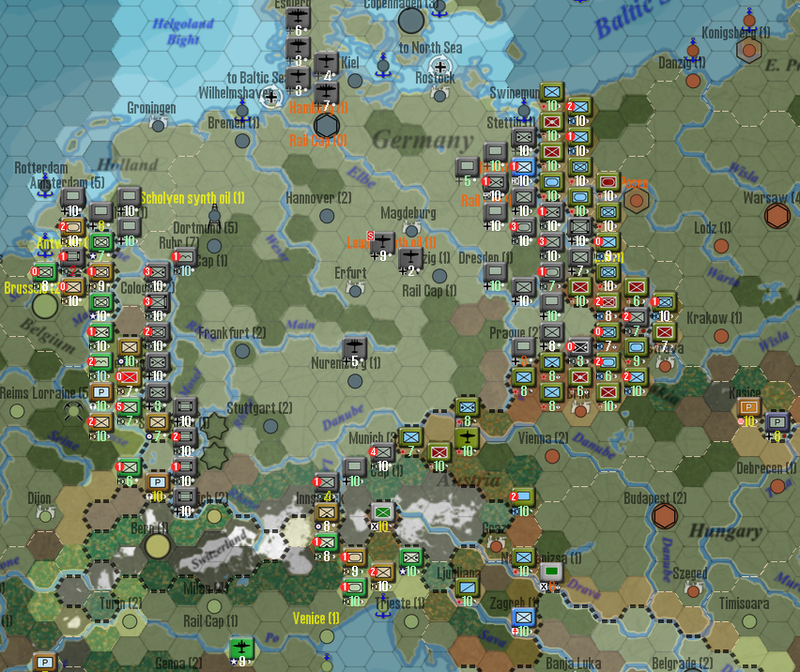 In February 1, 1945 (turn 101), it was fair weather in central and so the Soviets completely overran the Germans, taking Berlin. Western Allies reached Hamburg that very same turn, city falling on the next turn.